Ask your friendly neighbourhood butcher if you're new to this. Most Alberta beef is aged, so unless you have deep pockets, I find superly long aged meats don't differ too much vs regular aged beef in terms of tenderness... the enzymes in the beef will only tenderize it to a point, no matter how long you wait. 1) Size: General rule of thumb is one "rib bone" = feeds 2 people plus some leftovers. The toast pictured in the post is one that has 5 rib bones - I had a lot of people to feed that day.. and I wanted plently of leftovers! Oh, the verbal fights you can get into when people are passionate about how to season a roast. Bottom line is, whether you use a wet marinade, a dry rub, shove garlic cloves all over the roast or just plain salt and pepper it, a good roast needs some seasoning to bring out its deliciousness. I don't care HOW you plan to roast your roast - make sure it sits pretty for an hour or 2 to come up to room temperature. You don't want a roast that's completely overcooked on the outside and raw on the inside...but you will if you're not patient. For large roasts or special events, heck, I use two, a regular in oven meat thermometer and a digital in oven meat thermometer. It cuts out the second guessing. For digital in oven thermometers, measure because the probe needs to be completely in the roast and ideally not touching any bone. Personally, I like to gently sear my roast in a cast iron skillet or a big wok for larger roasts, as it helps seals in all the yumminess and the juices don't have as much chance to ooze out while the roast cooks. I've tried over the years (20years+ now of roasting prime rib roasts at home) to sear with the oven on 500F for a few minutes, then inserting oven thermometers and turning down the oven, and I found unless you get the timing just right, the 500F oven sear tends to leave a thick layer of overcooked beef on the outside (bleh), so searing it in a large pan, while more work - gives more consistent results. To add liquid or not at the bottom of the pan? I love gravy, so I always do - the steam it generates also keeps the roast more moist. Heck, I toss in veges to infuse the roast with more flavor. If you don't like gravy and want a more flavorful crust on the roast, elevate the roast and have its drippings drop into a lined pan for easy cleanup. To cover with foil or not? I usually cover with foil for 1/2 the cooking time and remove for the rest - if the fat cap is too small, it melts away and the top part of the roast will become overcooked and foil prevents that. Uncovering it 1/2 way also allows for the fat layer to get nice and almost crispy.. yum! You can also wait to cover it up if you notice the top getting too browned.. either way, make sure you don't touch foil to the meat thermometers or they'll think its a lot hotter than it is as tin foil conducts heat way better than air. 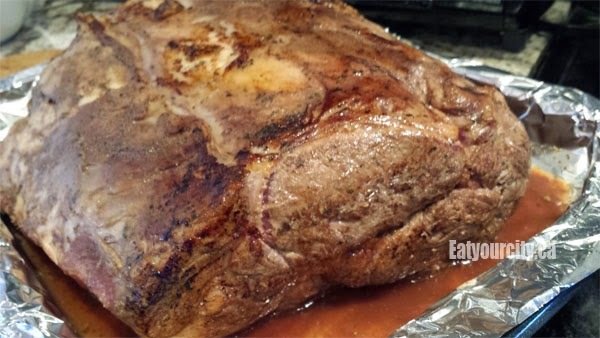 You've made it this far, for the love of tasty roasts, let your roast rest at least 15-20min so all the super heated juices settle down back into the roast and won't squirt out everywhere leaving you with a dry roast if you hack into it right away. 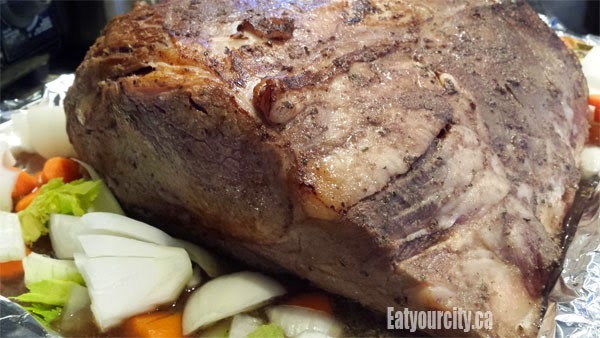 You can make gravy with the drippings while the roast rests. Notice how the meat has a grain (looks like lines) where the muscles of the meat seem to run, cut against it for silkier tender slices. 2 Tablespoons brandy - I use XO, so its a "kiss" of brandy! If you love garlic, feel free to poke your roast all over with a paring knife, leaving 1 inch or so slits, and cramming a glove of garlic into the slits - its roasted garlic infused roast heaven! Gravy: You can toss in a chopped onion, some carrots and chopped celery and about 2 cups of water or broth at the bottom of the pan. While the roast rests when its done, you can strain the liquid, siphon off the fat and make scratch gravy by adding in extra wine, seasoning to taste and thickening with a slurry of a bit of cold water and cornstarch. Preheat your oven to 325F with oven rack on bottom or 3/4 way down of the oven. After your roast has come to room temperature, sear it in a hot pan all over if you like, then toss it into the oven in a foil lined pan and roast for 12-15min per pound. Use 12min/pound if you're aiming for rare and 15 min/pound if you're aiming for well done. The minutes/pound will give you a rough idea when your roast will be done.. but your meat thermometer will tell you when its perfect! 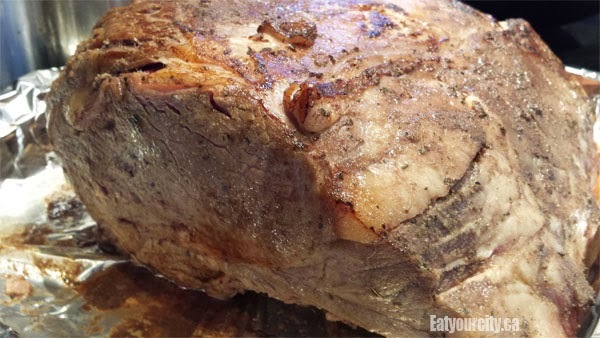 Remember to rest the roast 15-20min before slicing.. dig in!